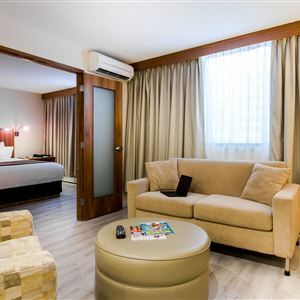 Property Location A stay at International Hotel and Spa Calgary places you in the heart of Calgary, walking distance from GRAND and Calgary Chinese Cultural Centre. This hotel is within close proximity of The New Gallery and Wonderland Sculpture. Rooms Make yourself at home in one of the air-conditioned rooms featuring refrigerators and microwaves. Rooms have private balconies. Wired and wireless Internet access is complimentary, and flat-screen televisions with cable programming provide entertainment. Private bathrooms with shower/tub combinations feature complimentary toiletries and hair dryers. Amenities Take advantage of recreational opportunities offered, including an indoor pool, a sauna, and a 24-hour fitness center. Additional features at this hotel include complimentary wireless Internet access, ski storage, and gift shops/newsstands. Dining Enjoy a meal at a restaurant or in a coffee shop/café. Or stay in and take advantage of the hotel's room service (during limited hours). Quench your thirst with your favorite drink at a bar/lounge. Business, Other Amenities Featured amenities include complimentary wired Internet access, a computer station, and express check-out. Self parking (subject to charges) is available onsite. 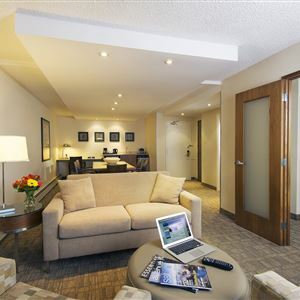 A stay at International Hotel and Spa Calgary places you in the heart of Calgary, walking distance from GRAND and Calgary Chinese Cultural Centre. This hotel is within close proximity of The New Gallery and Wonderland Sculpture. Make yourself at home in one of the air-conditioned rooms featuring refrigerators and microwaves. Rooms have private balconies. Wired and wireless Internet access is complimentary, and flat-screen televisions with cable programming provide entertainment. Private bathrooms with shower/tub combinations feature complimentary toiletries and hair dryers. Take advantage of recreational opportunities offered, including an indoor pool, a sauna, and a 24-hour fitness center. Additional features at this hotel include complimentary wireless Internet access, ski storage, and gift shops/newsstands. Featured amenities include complimentary wired Internet access, a computer station, and express check-out. Self parking (subject to charges) is available onsite.